Clever digital Out of Home ads at London Stansted Airport are enabling travellers to make quick-fire judgements on the quickest route into Central London. Digital Out of Home production agency DOOH.com in partnership with LIDA, who are part of the M&C Saatchi Group, have designed the logic behind the system, ensuring travellers are provided with live travel comparison information demonstrating the speed and efficiency of the Stansted Express rail service versus alternative routes in and out of London. The digital screens are positioned at the baggage reclaim area of Stansted Airport, providing passengers with live journey time comparisons between car, coach and the Stansted Express train service to London Liverpool Street station; all powered by real-time data via multiple API’s. Stansted Express delivers an average journey time to Liverpool Street of 47 minutes with departures every 15 minutes during the day, and 30 minutes in the early morning and late evening. Chris Ford, Marketing & Digital Manager at Stansted Express, commented, “We appreciate this part of the journey is a fine balance of excitement and frustration for passengers, particularly as navigating transfer options can be tricky. Victoria Nikishina, client services director at Primesight celebrated the campaign saying “It’s fantastic to see Stansted Express use the full dynamic capabilities of digital out-of-home to enhance their already established long-term holding at London Stansted, reaching 27 million passengers a year. “Stansted Express’ use of real time traffic data across our digital arrivals gallery and D6 networks enhances the consumer journey and helps the arriving audience make informed choices on the best, most available mode of onward travel. 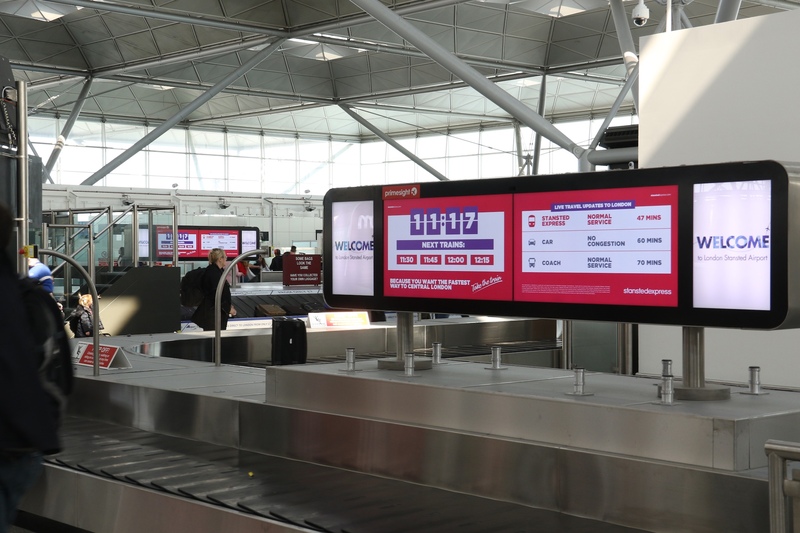 The project was jointly devised and created by Stansted Express, creative agency LIDA and digital production agency DOOH.com, with ads appearing on media owner Primesight’s Digital Arrivals Network and Digital 6-sheets.